1 8,689 people were registered from administrative databases, and could not declare an ethnicity. It is estimated that the proportion of ethnicities in this group is the same as that of the declared group. ↑ Президент Российской Федерации. Указ №849 от 13 мая 2000 г. «О полномочном представителе Президента Российской Федерации в федеральном округе». Вступил в силу 13 мая 2000 г. Опубликован: "Собрание законодательства РФ", №20, ст. 2112, 15 мая 2000 г. (President of the Russian Federation. Decree #849 of May 13, 2000 On the Plenipotentiary Representative of the President of the Russian Federation in a Federal District. Effective as of May 13, 2000.). ^ ا ب "Всероссийская перепись населения 2010 года. Том 1" [2010 All-Russian Population Census, vol. 1]. Всероссийская перепись населения 2010 года (2010 All-Russia Population Census) (in Russian). Federal State Statistics Service. 2011. Retrieved June 29, 2012. ↑ The density value was calculated by dividing the population reported by the 2010 Census by the area shown in the "Area" field. Please note that this value may not be accurate as the area specified in the infobox is not necessarily reported for the same year as the population. 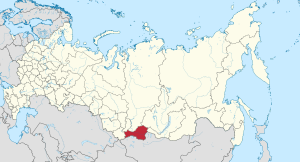 ↑ Official the whole territory of Russia according to Article 68.1 of the Constitution of Russia. ↑ 2012 Survey Maps. "Ogonek", № 34 (5243), 27/08/2012. Retrieved 24-09-2012.